Cows are in the class of animals known as ruminants. Ruminants are hoofed animals with an even number of toes and complicated four-chambered stomachs designed to break down difficult to digest plant matter (such as fibrous grasses). 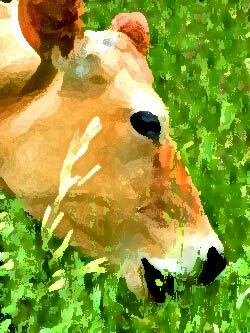 All ruminants regurgitate and re-chew their food or 'cud' in a process called, appropriately enough, rumination. For 6-8 hours a day, they'll chew their cud to make up for not chewing much while actually eating the grass. This breaks up the plant fibers into smaller and smaller chunks and pumps fresh saliva into the mix. Speaking of which, depending on the moisture content of their food, cows can make an astounding amount of saliva every day. Although 15-20 gallons is probably closer to the norm and amazing enough, at the extreme, one study calculated up to 66 gallons/day! Nearly 280 liters! Why so much slobber? A big reason is that plant-digesting microbes work best breaking down tough cell walls in a nearly neutral pH environment, 6.2-6.8, preferably (pH is a way of measuring acidity and alkalinity: 7 is neutral, less than 7 is acidic, greater than is alkaline). The problem is, waste products from fermentation are acidic, so Nature, in its infinite wisdom, endowed cows with alkaline substances in their saliva (bicarbonate and phosphates) to give it a pH of about 8.2 and help maintain the favorable conditions in the rumen. Amazing! This is a good place to point out that feeding cows too much grain can drop, or acidify, the pH of the rumen and so affect digestion and milk composition. How much starchy grain is too much? Probably whatever quantity it takes to drop the pH of the rumen below 6.0, when cellulose-digesting bacteria can no longer do their job. Now, let's take a closer look at this amazing stomach and see what happens to the grass after it's eaten, er, chewed. You know what I mean! Follow the schematic below to help visualize the journey. Even with a diagram, it's a bit tricky! When you get into anatomy, you come across some pretty unusual names, and the inside of a cow is no exception. The first chamber of the stomach, the rumen (or paunch), is basically a large fermentation chamber found on the left side of the animal. Depending on the size of the cow, it can hold up to 25 gallons (from 220-260lbs./ 100-120kg) of fermenting plant matter. Next is the reticulum (or honeycomb), a sac-like structure actually attached toward the front part of the rumen, not far from the cow's heart. Because only a small partition of tissue separates it from the rumen, they're sometimes lumped together as the reticulorumen or vice versa. About once every 30-60 seconds, the contents of the first two compartments are mixed together by strong contractions. Because microbial breakdown of plant fiber is such a slow process, particles can remain in the rumen for 20-48 hours. During this time, over 200 types of bacteria, 20 different protozoa and numerous fungi are busily digesting the plant tissues. The VFA's, absorbed through the rumen wall, provide 50-70% of the cow's energy source. They are also carried via the blood to the udder for the manufacture of milk fat (triglycerides) and milk sugar (lactose). Aside from being a repository for heavy items a cow might accidentally eat (stones, bits of metal, etc. ), the honeycomb configuration of the reticulum enables it to "decide" whether particles are small enough to move on to the next chamber, the omasum (or manyplies), or be reformed into cud for regurgitation and further chewing. The omasum, a spherical structure with about a 2.5 gallon capacity (10 liters) acts like a transition or isolation zone between the rumen and the highly acidic last chamber, the abomasum (or true stomach). Constructed with numerous flaps of tissue similar to pages in a book ("many plies"), it has a remarkable surface area (43-53 square feet, 4-5 square meters) and absorption capability. Here, water and minerals are recycled for return to the rumen through the saliva. The abomasum, using strong acids and enzymes, just like our stomachs, breaks down protein in material passed along from the omasum. The main source of protein building blocks for the cow, however, comes from amino acids synthesized by bacteria way back up there in the rumen, using ammonia or urea for nitrogen sources. These newly constructed amino acids travel through all four chambers of the stomach and are eventually absorbed in the small intestine. From there, they're carried via the bloodstream to wherever they're needed, including to the udder where they're assembled into the whey, casein and enzymes that make raw, grass-fed milk such an excellent protein source. And all this time, you thought they were just standing there!